First, we’ve got lots of drowning going on, since rain isn’t always reasonable. When it drops a bomb, xeric herbs like sage dive out. Daphne explains what happened to Tracie Storie’s healthy, long-term thyme and others. Tracie keeps them on the dry side, which is good. Suddenly, the plants get drenched, humidity builds up in their dense centers, and root rot clips them. Get Daphne’s complete answer. With autumn’s heads-up that freeze is around the corner, Trisha preserves cold-tender herbs and chile pequins to use all winter. I love her tip to freeze ginger, too; just shave off a bit when you need it. But there’s lots to eat in winter, including edible flowers! Deena Spellman from Bastrop Gardens joins Tom to fill our perennial beds and containers with cheery petals, herbs, and vegetables. What about planting annual calendulas to fill spots left blank when perennials freeze back? They’re pretty enough to eat, especially sprinkled on homegrown lettuce salads. Plant enough to invite bees and butterflies to dinner! At Bastrop Gardens, Deena and husband Jeff Spellman operate an organic, “here to help” nursery that promotes good health for all of us, including the wildlife. They encourage us to include birds in our planting schemes this fall, with drought defiant choices like possumhaw holly. Deena gives us the scoop on why yaupon hollies are discouraged in fire-ravaged Bastrop as replacement trees. Fragrant dianthus is a charmer in the ground or in containers. Its abundant petals can spare a few to punch up your salads. Let’s spice things up with perennial oregano and cool-weather annual feathery dill. In spring, Swallowtail caterpillars will seem to appear overnight if you didn’t spot the adult laying her eggs on this larval host. I’m so partial to sweet little violas that I hate to eat even one petal, but per their common name, Johnny-Jump Up, they’ll jump back fast to replenish my pickings. Viewer Picture goes to Irene Phillips for this knockout container with summer annual Blue Daze. I imagine yellow violas to take its place this winter! Ooh, that gives me an idea. . .
We can’t eat Daphne’s Plant of the Week crossvine (Bignonia capreolata), but its spring and fall flowers are a real treat for hummingbirds and butterflies. Deer love it all the time. Like all vines, it takes a few years to get growing to cover an arbor, trellis, or chain link fence. It’s a great time to plant cultivar ‘Tangerine Dream’ or the original native that sports golden tubes with magenta center. It’s semi-evergreen, dropping its leaves in spring, just before new ones emerge. Daphne explains that it blooms on old wood, so prune after flowering. Oh, and it needs a little gardener control. Mine clambered onto Lady Banks rose until I gently intervened. On tour, meet Austin Neal, one of the most joyful people in the world! I first met him when he volunteered as a Travis County Master Gardener for KLRU’s 50th anniversary party. 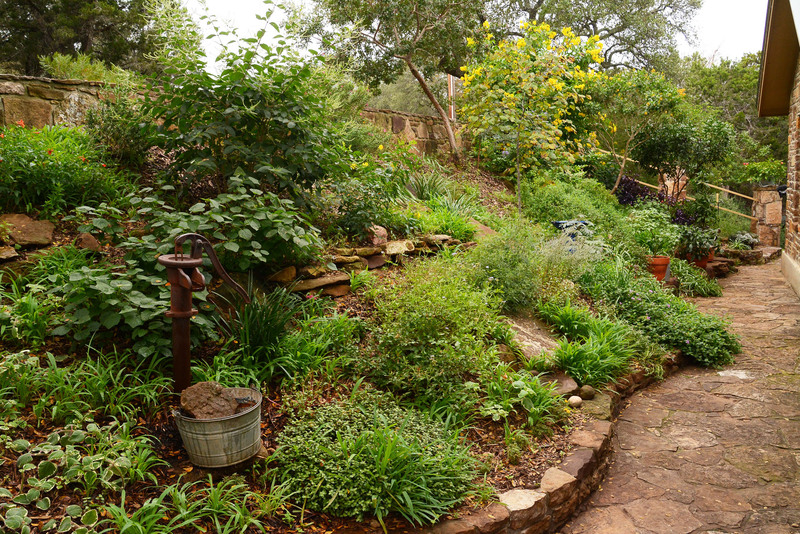 In his front yard courtyard garden, he blends food for him and wildlife along with serene spots to hang out and enjoy it all. To gently frame his courtyard, he recycled old fence planks with six different design panels. “It’s kind of a patchwork thing, which I like to think as a homage to my great grandmother who was a quilter,” he tells us. Cattle panel sections invite neighborly interaction. Neighbors often join him to wander the garden where he turned a one-dimensional yard into many levels of interest. He kept some grass for rescued dog, Zephyr. Since we taped, he’s planted a native blend of grasses. To clarify spaces, he built ipe boardwalks against decomposed granite sections. When he moved to Austin in 2008, he was clueless about Texas plants. With his tireless quest for knowledge and challenges, he dug in with layers of textures and seasonal attraction that require little water or constant babysitting. Now a Travis County Master Gardener, Austin starts other new gardeners on their journey with resourceful plants and techniques. In his vegetable beds, shaped to counterpoint the garden’s straight lines, he uses efficient ollas to water his organic vegetables. He can’t resist a creative way to repurpose lucky finds, like Habitat for Humanity roof tiles for succulent containers. In his wildlife active garden, he treasures beneficial wasps, as I hope we all do. Respecting their work of art, he attached abandoned nests to a repurposed mobile. Especially I love the ones shaped like a heart! Watch it now and get ready to feel joyful! ← What’s the BUZZ About Native Plants?